Well it’s official! I’m back in NYC for my 4th season at New York Fashion Week. Looking forward to a few shows (Tory Burch and Joie, to name a couple), some exciting meetings and a number of great parties. Click here to follow along with me on Instagram for real-time updates from the fun! One piece I brought with me to New York is this stellar Proenza Schouler jacket that I snagged on MAJOR sale at the Barney’s outlet in Carlsbad last month (no longer available in green, but this orange version is perfect for fall!). It goes with everything from wild prints to solids and will be a definite year-round staple. I also brought these jeans (you’ve seen them twice already, I know) – they are just too good to leave home! PS – thanks to all of you who gave me suggestions for my mascara woes! I’m definitely going to be doing some testing over the next few days – I’ll get back to you with results! Love this look and the snake print, these jeans were really a great buy. Love them, enjoy nyfw. That jacket is amazing and looks fab with those pants!! That jacket is stunning – an amazing find!!! 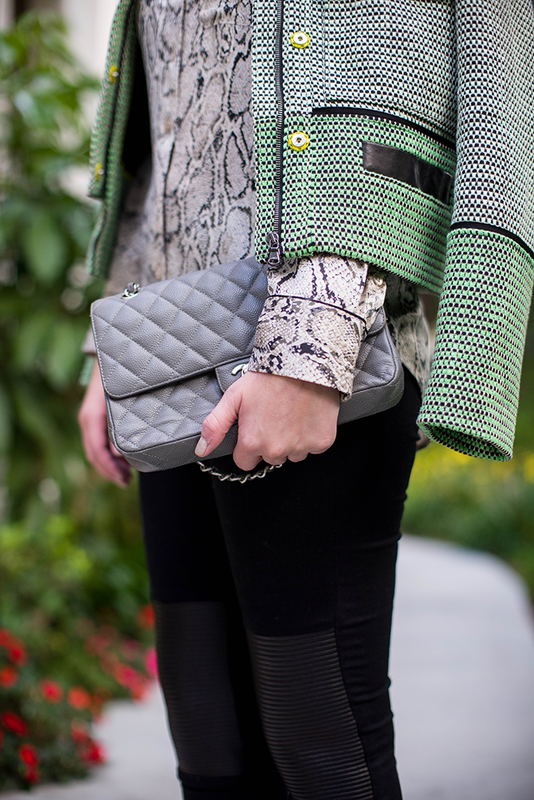 And I love the mix of prints and textures, such a great look for Fall! That jacket is just too good! Too good! THE jacket is right! It is total perfection, as are you! I hope you are having fun in NYC! loving this look on you – so gorgeous! that jacket is fantastic. I’ve seen this jacket in person and it is definitely amazing. Especially the fabric/texture. Great find Merritt!